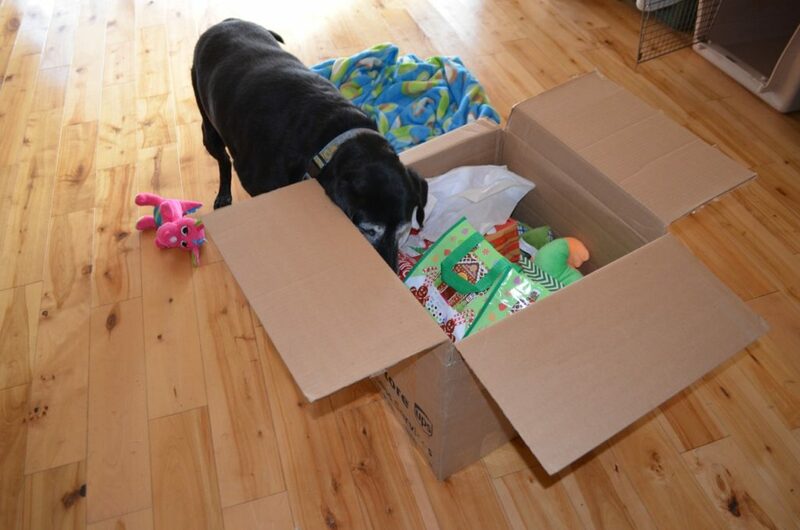 You are here: Home / Dogs / Why Wait For Christmas? This will be our last blog post for the year, and we’ll resume?on January 4th. With Christmas in a few days, this one with Stella seemed like a perfect way’to wrap up 2015. 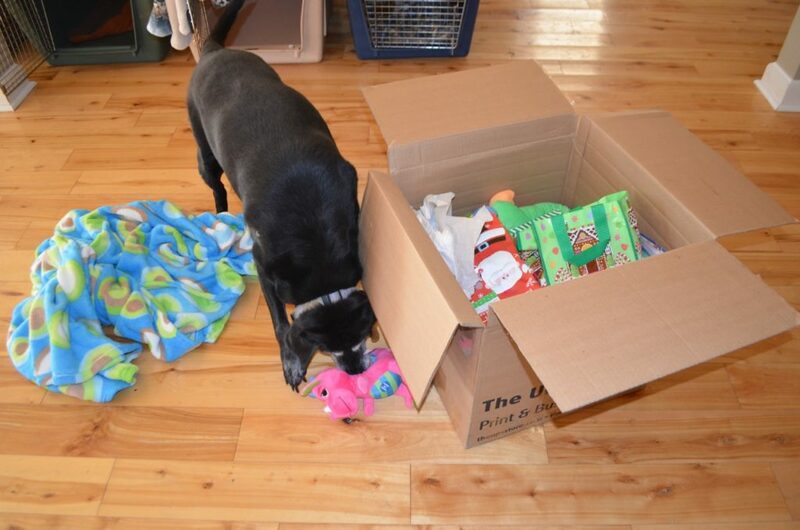 Alayne and I would like to thank all of you for your generous gifts’that make this nonprofit possible, because without your support we couldn’t take in dogs like blind Stella and the others who live wonderful, happy lives here. If you haven’t already made a?donation?for the animals this year and?would like to do so, you can make an online donation on our website here, or mail a check to the farm at P.O. Box 150, Lancaster, NH 03584. And don’t forget, your donations are tax-deductible. We are so grateful for your gifts thank you! We wish you the very best this holiday season! 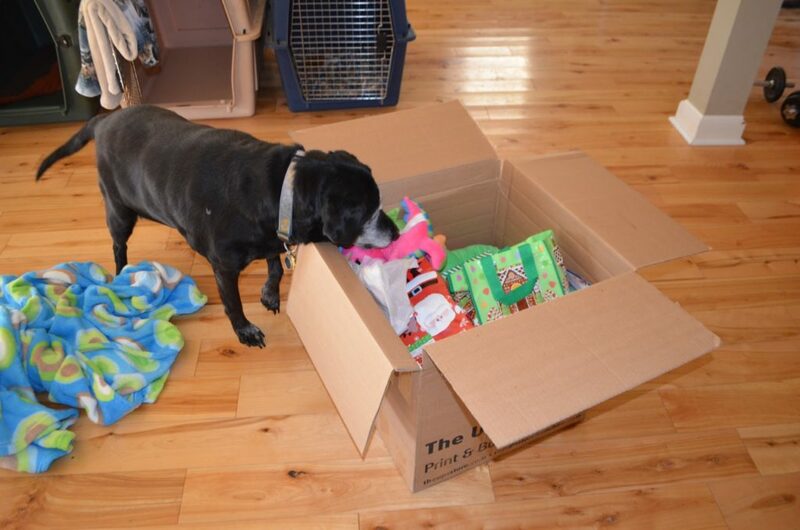 Our long-time supporter Barb R. recently sent another box of Christmas goodies for the dogs, and just like last year, blind Stella decided to unpack the box all by herself. Normally we would have waited until Christmas Day to?do this, but Barb had told us there were a couple of things in it that should?come out early (yum … chocolate for two humans!). 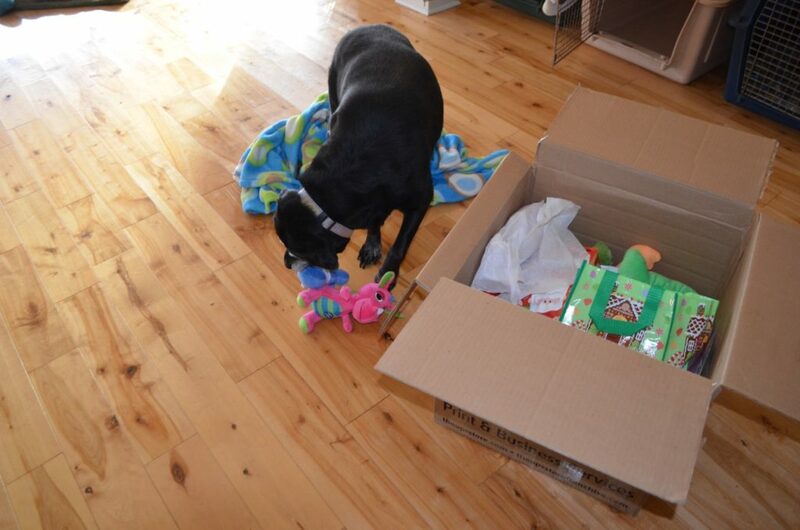 So Alayne opened the box, found the human treats, and went to put them in the kitchen. 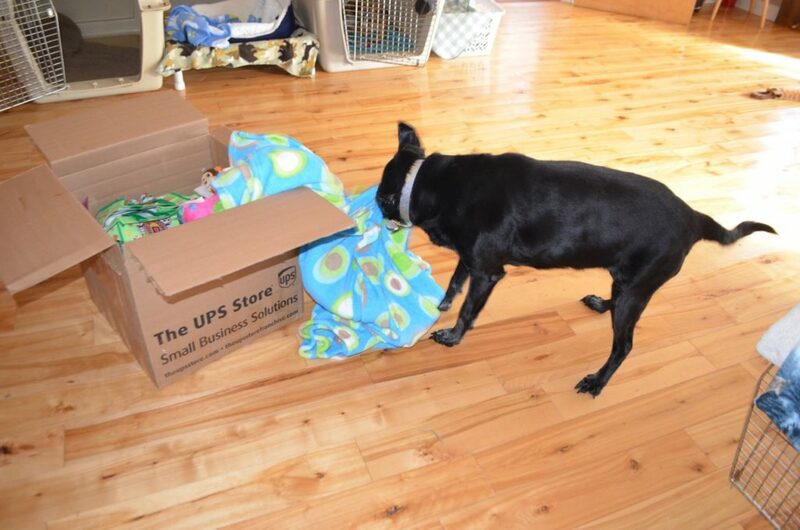 When she came back to tape the box back up, she found Stella had somehow made her way to the dog room and was already starting to help herself. Alayne got the camera and watched Stella do her thing. 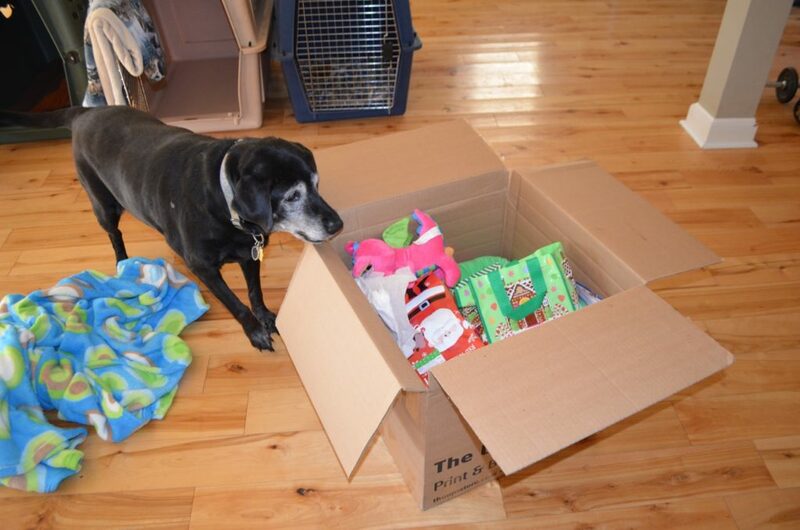 After that, Alayne decided Stella should?wait for Christmas for the rest of the box (and maybe let others share? 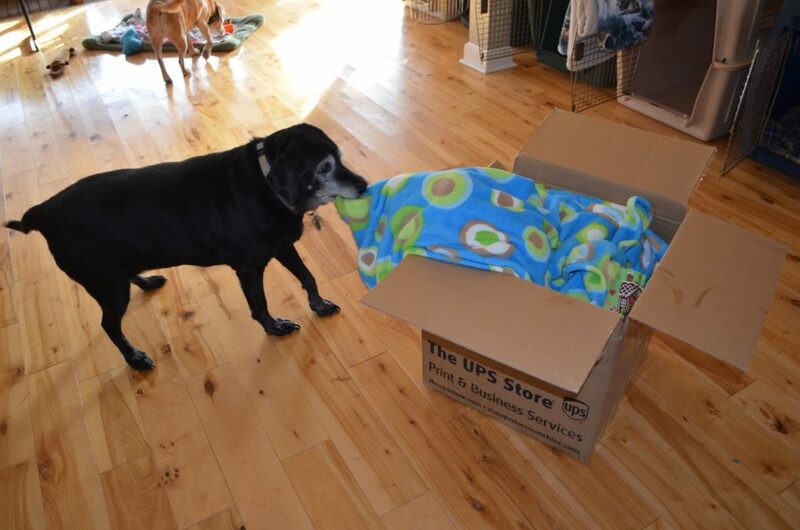 ), so she picked up the things on the floor, carefully packed them back in the box, and set it on a table safely out of reach. Somehow we have a feeling this will be just as exciting on Christmas Day all over again! Almost forgot: We have posted our winter/holiday 2015 print newsletter online now as a PDF (7.3 MB), available here. Merry Christmas and God bless you and all you guys do for these wonderful, amazing, precious animals. Have a safe holiday. She’s a riot, what a happy dog! Merry Christmas to you both and blessings in the New Year! Stella’s a great unpacker! And seems to consider herself in charge of quality control. Yes, I’m sure it will be absolutely as exciting on Christmas Day when it happens all over again. Merry Christmas and Happy New Year! Stay warm and healthy. Awesome! Love to all the pups and you two as well, Steve and Alayne!!!!! Happy Merry to each and every one of you. May the New Year find you all healthy and zippy as ever. I once had a miniature dachshund that would shake a toy until it fell apart. His job was not complete until it was so. This is too darn cute. Merry Christmas Steve and Alayne… and holiday hugs to all of those precious pups. She’s so fun to watch. You totally forget that she can’t see what’s she pulling out of the box. But at least she knows what her job is. Hope all the furry ones enjoy the toys and treats and everyone has a nice Christmas. Merry Christmas all around! 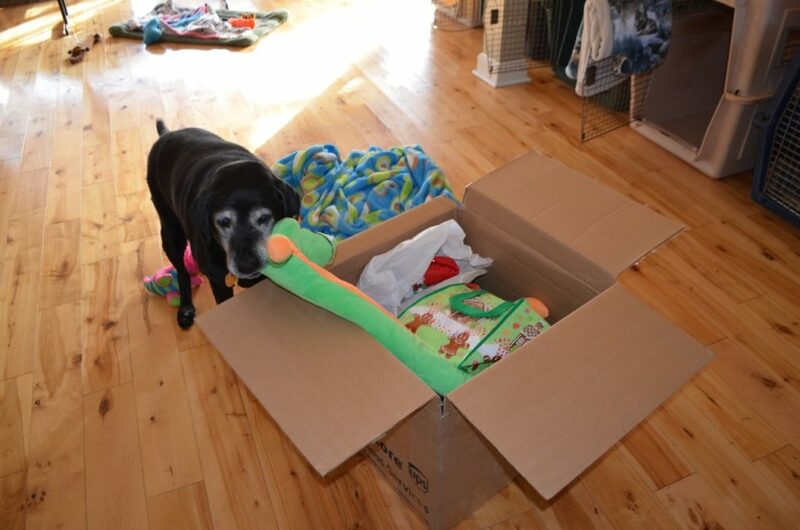 People and pets love toys….what a great gift box! We look forward to seeing your posts next year. You and Alayne are awesome! Yay Barb—Yay Stella—so happy she has her home with RDF!!!!! Merry Christmas to Steve and Alayne – heroes in our book.